It's been more than 3 years since the Hejnar Photo E31 Nodal / Macro Rail Review was published, which E31, may be consider the predecessor of the E030-60 nodal / macro slide rail in question here. A 6" (15.24 cm) nodal slide is targeting the needs of most mid to large sized cameras equipped with wide to short tele lenses. Nevertheless, since the E030-60 Nodal Slide has replaced the previous versions long ago, its review plays the role of a reference page in order to update and complement the presentations of my Panorama Heads and the relevant articles. The Hejnar Photo E030-60 arrived in padded envelope further enclosed in a zip-lock nylon bag with a Hejnar Folded Card, stapled on the top opening thus sealing the package. The hard folded card carries the model sticker with appropriate bar-code at the back. As usual with Hejnar Nodal Rails the a smaller zip-lock bag contained an Allen hex key for the M3 safety stop screws (already attached at the bottom of the rail as we shall see further down) and a couple of 5mm dowel pins, intended for the alignment of any Hejnar QR clamp at the rear end of the rail. According to the contemporary design of the Hejnar Nodal slides, the E030-60 features the standard bubble level at the front a 5 cm long captive slot, an 1/4"-20 tapped hole next to the slot and an 1/4"-20 tapped hole at the far end. The latter is for mounting Arca-Swiss® compatible clamps in any orientation. The clamp mounting hole at the rear end is surrounded by 5 smaller holes, 5 mm in diameter, which are designed to accommodate dowel pins for clamp alignment and twist prevention. As all Hejnar Photo products the E030-60 is CNC machined from 6061-T6 Aluminium and is black hard coat anodized with white laser engravings of the Hejnar Logo and decimal scales along both sides. Should I point out here once more, that in my opinion Hejnar nodal slides have the 0 mark of the decimal scales correctly placed, which coincides with the center of the QR clamp mounting hole, thus the center of the QR clamp. This position allows for precise measurement of the NP (Non Parallax Point) in relation to the camera mounting screw most of the times. M3 safety stop screws are placed at either end of the bottom side. Further we can see the center brace with the 1/4"-20 tapped hole for mounting the rail directly on any pod with a 1/4"-20 stud and the extensions of the QR clamp mounting hole and dowel pin holes. Besides the half inch difference in length, there are some more obvious and not so obvious differences between the old and new rails. On the top side, the green Bubble level catches the eye at first sight. Next, the laser engraving is extended on both sides, but with the scales 1 cm shorter as the new rail itself is 1.25 cm shorter. Due to the same reason and the addition of the bubble level on the new rail, the captive slot is 5 cm long instead of 8 cm on the old. Not so obvious though, is a second dowel pin hole in front of the 1/4"-20 clamp mounting hole which serves for the alignment of the larger Hejnar F62 series of clamps. The bottom side reveals the existence of a second M3 safety stop screw at the rear end of the rail, just below the Qr clamp. Otherwise, except for the island of the second dowel pin hole at the front of the mounting hole, there is little to talk about. Lastly the Hejnar PHOTO E030-60 6" eqipped with the latest F61b 1.5" QR clamp lays aside the E031 6.5" nodal rail which is equipped with the older F61 QR clamp instead. For more information about the original rail may be found in the Hejnar Photo E31 Nodal / Macro Rail Review. The Hejnar F61b* 1.5" QR clamp (review) is the natural companion to the E030-60 Nodal Slide. 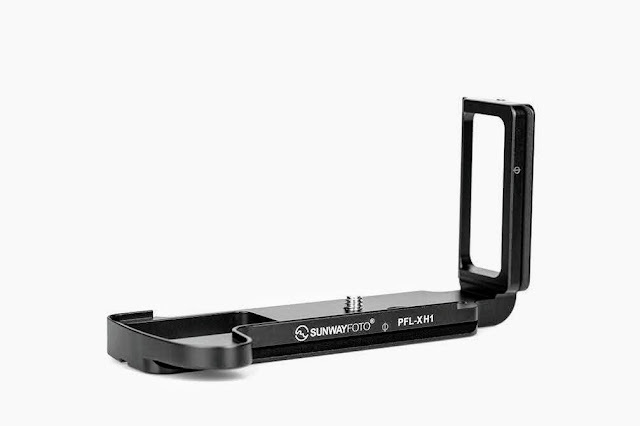 Now that the updated F61b version features safety stop relief grooves allows for more space in lateral adjustment of a camera plate within the clamp jaws. Mounting the updated Hejnar F61b 1.5" QR clamp in line with the E030-60 rail is easy. Just need to insert one or both of the included alignment dowel pins, aside of the 1/4"-20 mounting hole and then tighten the 1/4"-20 flat head screw included with the QR clamp. The clamp is automatically aligned and fixed. 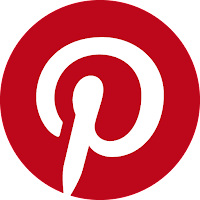 Nevertheless, the whole point of having a removable QR clamp on a nodal rail, is to be able to reorient it in any direction you wish, with the knob facing on either side when attached in a perpendicular axis to the rail. In this case the alignment dowel pins have to be inserted one in front and one behind the 1/4"-20 mounting hole. Likewise, the clamp is aligned and tightened by the included 1/4"-20 flat head screw. 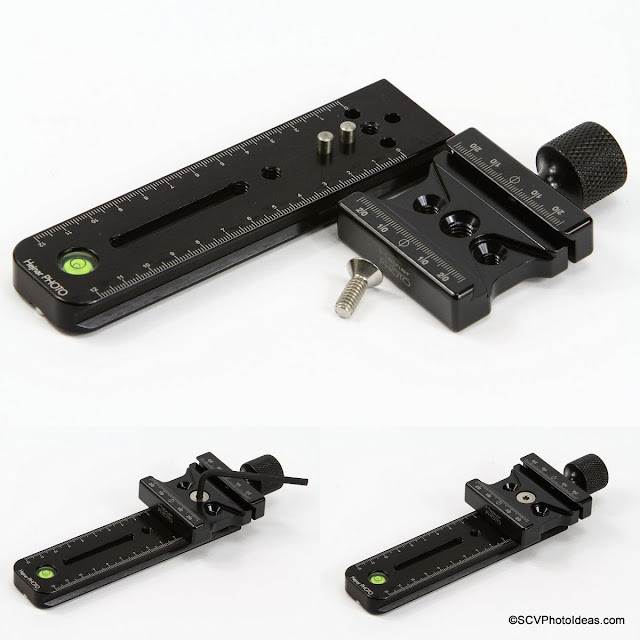 Although the F61b QR clamp allows for lateral movement within the clamp, in case your camera quick release plate is mounted at a substantial offset position and a greater lateral alignment is required to bring the center axis of the lens over the center axis of the nodal, then the larger, 60 mm wide, Hejnar PHOTO Updated F62Ab Quick Release Clamp (review) would be more appropriate with its larger jaw length to allow for adequate movement within the clamp. Nevertheless, although minimal, a little extra cost in price and weight should be considered. Although the concept with the alignment dowel pins remains the same, the existence of extra mounting holes aside the center mounting hole on the clamp, do not permit for dowel pin holes close enough as with the F61 series of clamps. 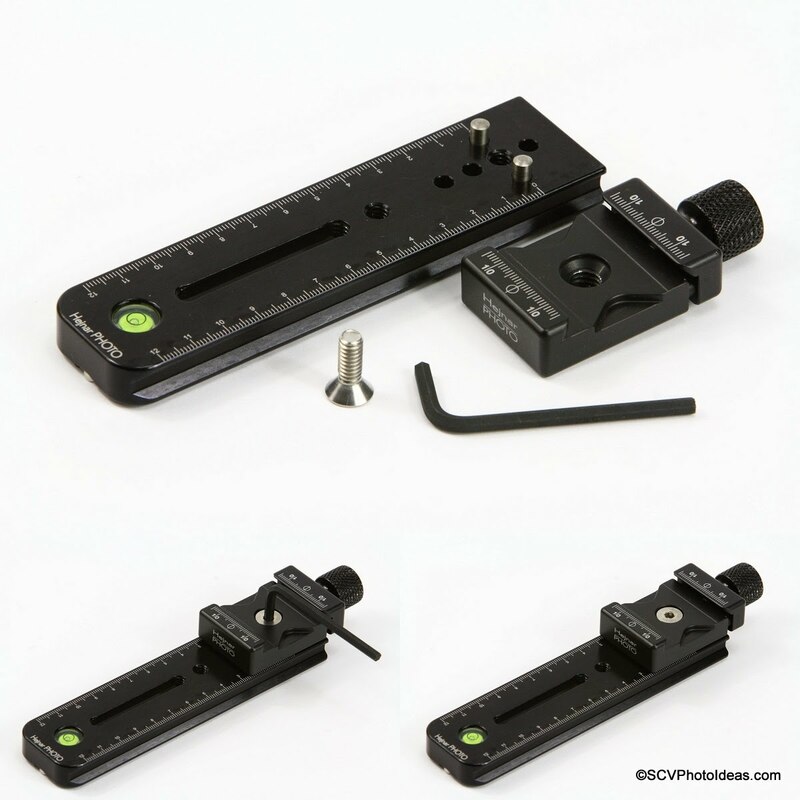 So with the F62b clamp we can use either one or both of the included dowel pins aligned in front of the 1/4"-20 mounting hole on the rail, in order to coincide with the two adjacent dowel pin holes at the bottom of the F62 series clamp. Mounting the larger updated Hejnar F62Ab QR clamp in line with the E030-60 rail requires exactly the same steps we took before for the smaller clamp. Insert one or both the dowel pins and then tighten the 1/4"-20 flat head screw included with the QR clamp to secure it in place. My version of a Heavy Duty Multi-Row Panorama Head is shown below. The structure is based on Hejnar PHOTO G20-10 5/8 Multi Purpose Rail (Review) as a horizontal rail, the Hejnar PHOTO G21-80 MPR/Vertical Rail (Review) obviously by name for a vertical rail and with the combination of E030-60 and the Updated F61b QR clamp used as a Nodal Slide. You may seek full details in the article Create a Heavy Duty Multi Row Panorama Head. Further to the rail structure, Sunwayfoto DDP-64Si Panoramic Indexing Rotator (Review) combined with the DDY-64i Discal QR Clamp is pictured above in the role of vertical rotator; Sunwayfoto DDP-64M Indexing Rotator (Review) combined with the DDY-64iL Discal QR clamp is shown as horizontal rotator on top of Sunwayfoto DYH-66i Leveling Base (Review) which supports and levels the whole structure. Very Good machining, finishing and build quality. Very Good hard coat anodizing. Appropriate Hex Key and accessories included. Dovetail compatible with RRS lever release clamps. None found against the purpose of the product. Although a small firm the Hejnar products quality has proven impeccable over the years, nonetheless the quality and versatility of their nodal slides. One the other hand, as I mentioned in the beginning of this article, as the E030-60 Nodal Slide has replaced all previous versions, this plays the role of a reference page for all the relevant to my Panoramic Heads articles. In this respect all references to a 6" nodal slide in the articles Create a Multi Row Panorama Head Ver. II and Create a Heavy Duty HDR Multi-Row Panorama Head, should now be addressed to the E030-60. Further more, the "SCV Panorama Packages" from Hejnar Photo store, which are offered with a 6" nodal slide, now contain the E030-60 in place of any previous version. Note:The E30-60 Nodal Slide presented in this article was kindly offered by Hejnar Photo for evaluation and review. 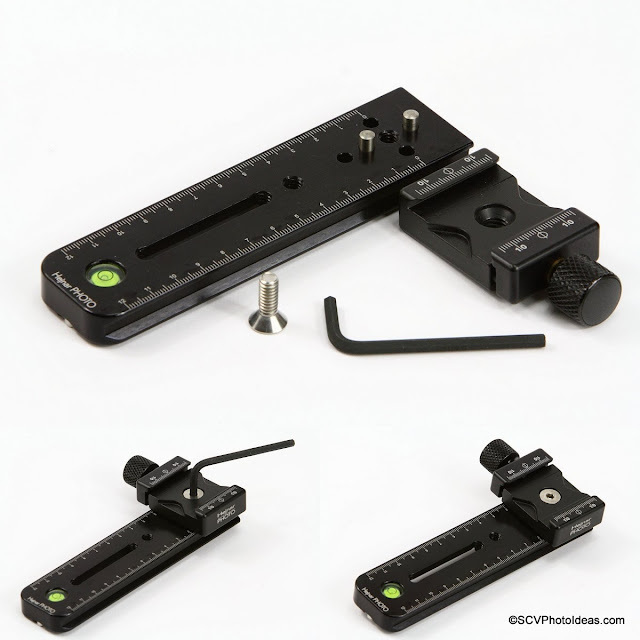 Current price for the E030-60 base rail is US$ 45.00 while for the E30-60 rail + F61b clamp bundle is US$ 90.00 (+Shipping where applicable). Both products are available from Hejnar Photo store.